Okay, here it is! The image that won a Silver with Distinction at the SA Professional Photography Awards this week. This beautiful baby girl was born in Adelaide at the Women’s and Children’s Hospital, in a room full to the brim with specialists and support people. Her heart condition meant this sweet baby girl would be rushed to NICU for treatment and would undergo heart surgery in Melbourne as soon as possible. The midwife’s hand over the baby’s heart, guiding her into the world as the baby cries with vigour symbolise the spirit and journey of this little girl. I am absolutely honoured, not only to have been invited to be one of those people in the room and to have captured this moment for the mother, but that this mother was so thrilled to share this photograph with the world! As with the ability to reflect on profound experiences with the help of imagery, I know this image has helped the mother deal with the birth journey she endured. To me this shot is so incredible on so many levels. Birth Photography is an amazing genre that has an array of heartfelt things to offer us. It really isn’t all about the shots of a baby coming out and a part of me gets annoyed about this stigma (which I’ve now possibly added too by sharing this image with the wider community). Birth photography is about the journey, the lead up, the individuals involved, the emotions, struggles and joys, and how that’s all put together. It’s about documenting the beauty of life at its most vulnerable yet powerful point. I love every minute of what I do and how it honours women. This image is now on exhibition! The AIPP SA division invites you to view all of the images that scored a silver with distinction award or higher. Where: National Wine Centre, Hackney Road, Adelaide. When: Official Opening 6:00 – 8.00pm Monday 15th of July. Exhibition can viewed from Friday 12th to Friday 26th of July. The following shots are also Award winners from this and last year’s SAPPA’s. 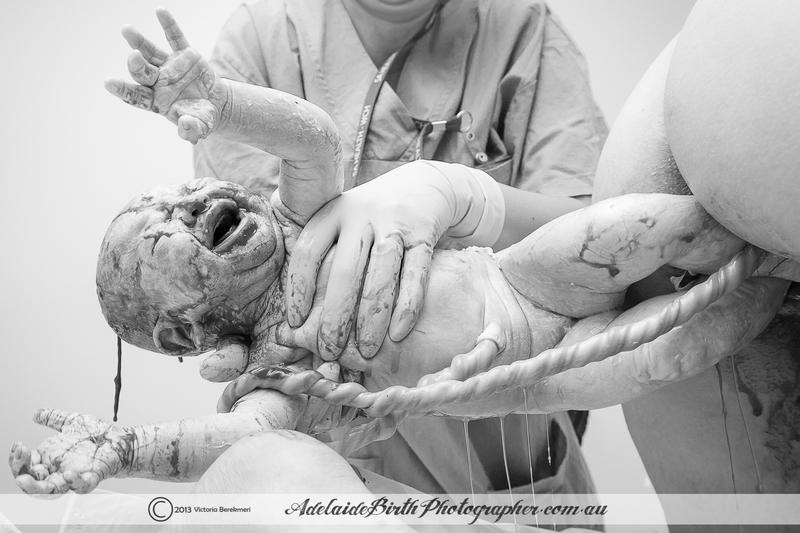 This entry was posted in Birth, Materntiy, Newborn and tagged adelaide birth photography, baby being born, Birth, Materntiy, newborn, Pregnancy on July 13, 2013 by Adelaide Birth Photographer.